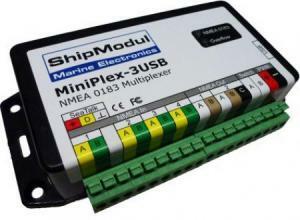 The MiniPlex-3 multiplexers are all functionally identical but differ in type and number of computer interfaces. 8-35VDC, secured against reversed polarity. 50mA (100mA max. with fully loaded talker ports). 4 x NMEA 0183/RS-422, galvanically isolated. Input 1 can be set to SeaTalk mode. 2 x NMEA 0183/RS-422, galvanically isolated.